#Ausopen @benoitpaire @tsonga7 @Gael_Monfils @richardgasquet1 @ERogerVasselin @jimchardy #Simon #Robert. 8 Français au 3e tour, un record ! Andy Murray is seeded fourth for the Australian Open with world number ones Rafael Nadal and Serena Williams leading the way. Wimbledon champion Murray, a three-time finalist in Melbourne, is playing his first grand slam since back surgery in September ruled him out of the final two months of last season. He has dropped only one place in the standings in that time, behind Spain's David Ferrer, and cannot face either Nadal or three-time defending champion Novak Djokovic until the semi-finals in Melbourne. Argentina's Juan Martin del Potro is the fifth seed ahead of 17-time grand slam champion Roger Federer, with Tomas Berdych, Stanislas Wawrinka, Richard Gasquet and Jo-Wilfried Tsonga rounding off the top 10. The top 28 seeds correspond directly to the rankings but Canada's Vasek Pospisil, who lost in qualifying 12 months ago, is elevated to 29th because of Jurgen Melzer's withdrawal through injury. Spain's Fernando Verdasco is the 32nd and final seed. New York, it's Tuesday morning 8.30 o’clock. Slowly I wake up, I'll pack, and answer several phone interviews to Rafael Nadal 's victory over Novak Djokovic. The whole world wonders if he can beat the record set by Roger Federer, with 17 Grand Slams. I think it's a bit early to talk about it. You have to wait and see. Let's stop speculating about everything and nothing ... This is my opinion! While packing I realize that I have to buy another suitcase to bring home the gifts for my children. So downstairs to the hotel shop and get a new suitcase because mine is about to burst! Now it's 12am and I get in the taxi to Kennedy Airport. Although I am early, my flight is at 16.00 h, but I love to have time. I check the shops at the airport to buy another bag and then go to the Air France lounge to write this blog. I have to say that I’m very happy to come home to Levallois. To see my wife Florentine and my kids Jules, Ulysse and Marylou, my princess. I missed them a lot. Of course I also missed my ‚big ones’ Maxim and Luna. Not to be there with the kids at the beginning of school was really something bigger. They were very nervous to see their friends again, and were wondering if they all would be in the same class. Huge excitement for them ... and unfortunately I missed all that and wasn’t there to share this important moment with them. I have to admit that it was a great pleasure writing down my analyzes, experiences and feelings during the U.S. Open. It was the first time form e doing that but certainly not the last. This daily exercise also helped me. I sort of looked in a mirror to write down my feelings, share my doubts and what moved me on the ATP World Tour. 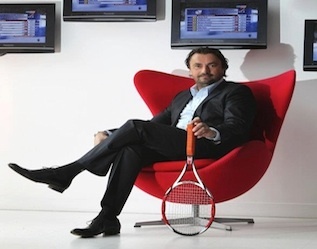 These reports not only appeared on my Facebook, but also in 3 languages (German, English, French) on my website www.Henri-Leconte.com. I had a lot of fun reading your tweets and reactions. Also on my blog back. I was pleasantly surprised that many journalists read my blog, too. I understand this world a little better now. Thank you. Perhaps there is a way for me to do someting like that on the radio? With regard to Eurosport, it was a great adventure again. It was our first time with ‚Avantage Leconte’ at the U.S. Open. It worked very well with the whole production team, all took care for me and I want to thank them warmly. A short message to one of you: ‚Hola Pedro’! He was very sure that Rafa would win the tournament. 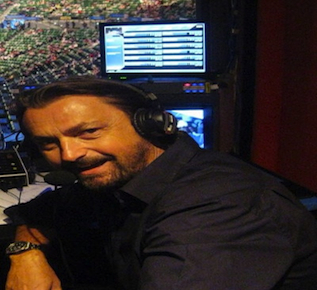 I had a lot of fun commentating some matches with Bertrand Millard, including the match with Gael Monfils. But I regret not to have been able to commentate the men’s final with him. Maybe next time! Next weekend I’ll meet my friends Mats Wilander, Mikael Pernfors and Pat Cash in Arcachon / France at the Legends Rendez -Vous (September 13-15). So, come to Arcachon for the weekend! Then from September 25-27 I’ll be in Lyon at the Classic Tennis Tour with Yannick Noah, Mansour Bahrami and Fabrice Santoro. That’s it so far, my last words from the U.S. Open. It is very special to play the final on a Monday. Normally the final is played on Sunday. But due to the unsettled weather over the past five years, it is now played on Monday. Also this year the USTA decided to do it on Monday. The atmosphere at the final is exceptional, even if you do not play yourself. Everyone can feel the pressure. Look at this anthill, all around centre court it’s teeming with people. They are all there: sports stars, actors, politicians and the normal audience. It’s getting even more crowded. All of these people, the celebrities, the rich, the famous and the "tennis crazy" people eagerly await the final in the wonderful Arthur Ashe Stadium. The taxi ride took me very long because of heavy traffic to Flushing Meadows. After my arrival I hurry up to the Eurosport club to see if everything is okay and if I need to prepare for any interviews. Over the past few days we’ve already prepared many features for the male finals. We are well prepared at Europsport, so now all of us can watch the final just like you do. It will be fascinating to see how these two "grandes" will compete, just like every time. I certainly hope so! The weather conditions are good, it's not too hot, not too cold, but very windy that’s what the two need to consider in their play. In the offices and newsrooms there is excitement everywhere. Everyone begins to pack his equipment, they want to be prepared to leave after the final as soon as possible. Here we are at the Arthur Ashe Stadium (about 22,540 spectators), up to now the largest tennis stadium in the world. We welcome Novak Djokovic and Rafael Nadal! The first set is impressive, Rafa has dominated and wins 6-2 over Novak. He beat Nole despite the wind and the enormous pressure. The second set begins with incredible rallies. No one is giving in. Rafa with his incredible backhand. The pressure is increasing in the second set with a more aggressive Novak. 54 incredible rallies lead to 3-2. Novak leads 4-2. Then 4-3, 5-3. He wins his serve, the the first set is done, 6-3. It’s getting cooler. Everyone in the stadium now needs a jacket or sweater. Completely different weather compared to the last few days. And with the wind, really not easy to play. So Novak has equalised. I feel like Gad Elmaleh used to say in his comedy "Just a small coffee". I am privileged to be here, but also frustrated because I’m watching this match like you on Eurosport, but I would just love to comment it live on TV. Both hit the ball harder and harder. You might think it's table tennis, they play so fast! The rallies are getting longer and longer and nobody makes a mistake. How are they doing that? It 's crazy, like in a bullfight without the ‚Olééééééé’! The crowd is screaming! An atmosphere you only get in the United States. Rafa finally is coming back and plays much better. He defends every ball like a lion, and leads 4-3. Now Nole again. I follow everything exactly and I'm out of breath – what a game! 4-4. Nole had three break points. Rafa plays an ace at 30-40 with 201 km/h ... incredible. Rafa will not let go! What a wonderful lesson for all young people who watch this match. Never give up, always believe in yourself no matter what and always stay focused. Every day we can learn from these two extraordinary champions! It goes on and on, a very close match! Nole leads 30-0 and loses the set 6-4 in the end. Rafa is strong. Nole probably thought this could be a more easy set. But no ... Rafa now leads by two sets after 2 hours and 45 minutes. Beginning of the fourth set. I'm at Eurosport with my friend Mats Wilander. We discuss the match and we both believe that Rafa will win in four sets. Rafa wins his first match and breaks Noles serve. Rafa is over the moon, leads 3-0! Both fight even more, they play better and better. Very impressive, but Rafa is unbeatable. He leads 4-1. Then Nole unfortunately loses his serve and makes stupid mistakes. Nadal leads 5-1. The end seems to be near and Rafa tries to win his serve. 15-15, then 30-15 with an ace. Then 40-15 – can he end it now? And the ball was called good! Rafael Nadal has won his second U.S. Open title. Bravo, Bravo, Bravo! An extraordinary champion. What a great success for Rafael after these difficult times and his knee problems. Once again it was impressive to see who is physically tougher to win the match. I have no words to express my deepest respect. Rafael Nadal is so strong. Soon he will be number 1 in the world, I 'm sure. The tournament is over and I hope that I was able to give you some inside views oft he tournament, my words and feelings in detail. It was a great pleasure for me. Upon my return, I'll do an analysis of the tournament for you. Thank you very much, see you!